The full-size Aerodrome was a tandem-wing aeroplane powered by a 38.75 kVV (52 hp) Manly radial engine driving two 2.67 m (8 ft 9 in) propellers. Wing span was 14.63 m (48 ft in). 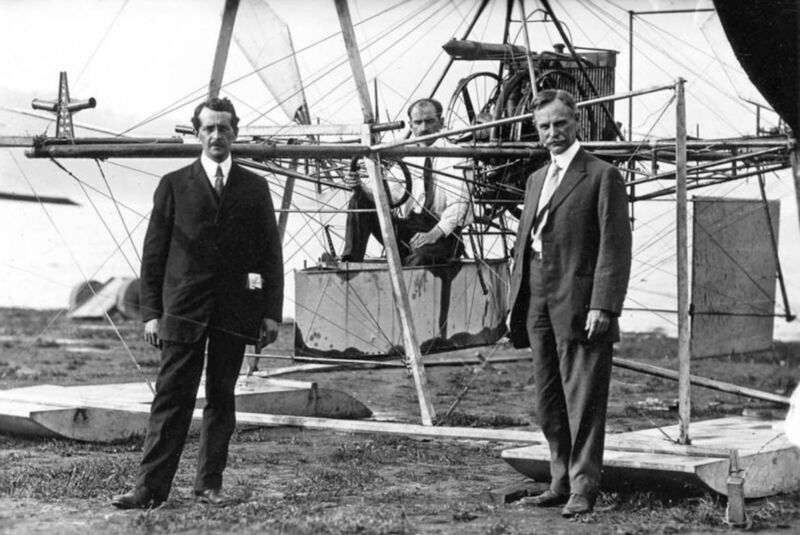 UNDER the above title Mr. Griffith Brewer read a paper before the Royal Aeronautical Society on October 20, in which he traverses the now generally accepted claim that the Langley machine of 1903 has been flown. He maintains it never has been flown or ever could fly. Mr. 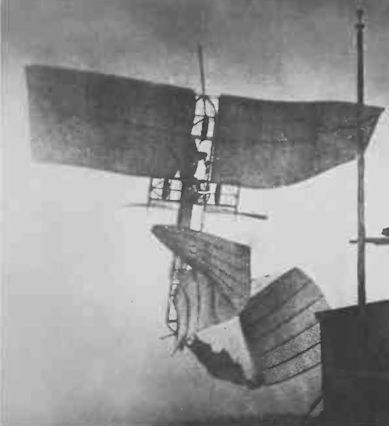 Brewer's contention is that the machine was so weak structurally, and of so bad design, that it could not possibly have flown in its original state, and in his paper he alleges that the machine was so altered for the flight tests made by Glenn Curtiss as to be virtually a different machine. We have not the space to publish Mr. Griffith Brewer's paper in full, but the following brief summary, and some of the illustrations from the paper, will serve to show the main points of the lecturer's contentions. 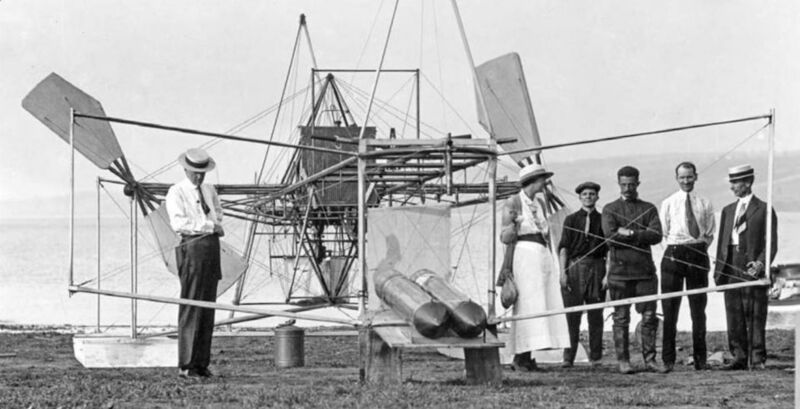 There is little doubt that the paper will cause Something of a sensation in America, where the question “Langley or Wright Brothers,” had caused much more controversy than it has on this side. In the openin paragraphs of his paper Mr. Brewer refers to some remarks made by Lord Northcliffe during the discussion on the Wilbur Wright Memorial Lecture given by Mr Brewer in 1916 in which Lord Northcliffe stated that he has firmly convinced that the credit of the first flying machine is due to the Wright brothers, and from the point of practical flying to nobody else. Mr. Brewer said that he had recently returned from further investigations in America, and that as a result of these he was now in a position to report to the Royal Aeronautical Society that the reports of the Hammondsport trials in 1914 are inaccurate as recorded at the Smithsonian Institution. 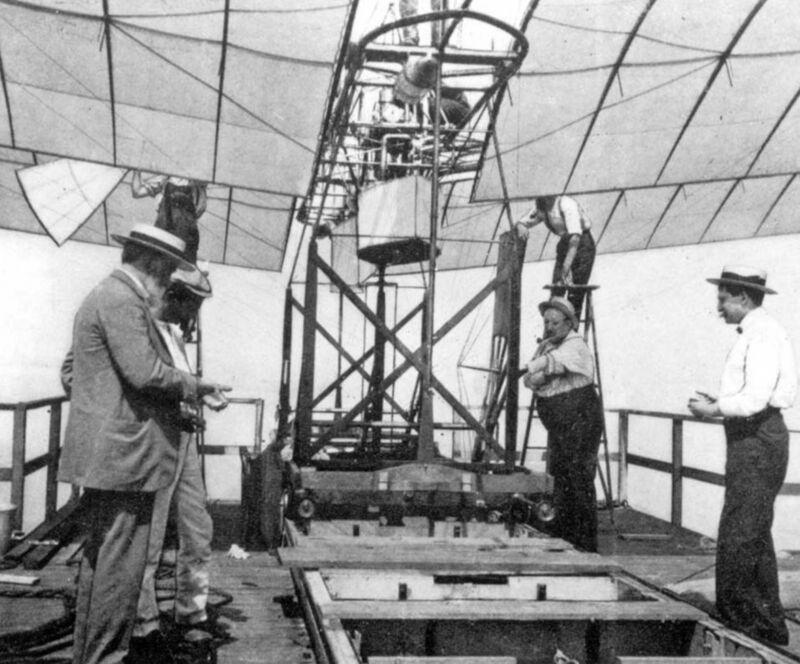 The lecturer then referred to the early history of the Wright brothers and of Langley, pointing out that they had been carrying on their investigations independently hundreds of miles apart, and had both approached the final stage of their independent experiments at the same time, Langley tested his machine a few weeks before the Wrights were ready to test theirs, and the attempts to fly the Langley machine failed. The Wrights, one week after Langley's second attempt, tested theirs and succeeded. Mr. 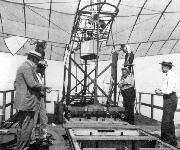 Brewer stated that the Smithsonian Institution has always attributed the failure of the Langley machine in 1903 to a failure in the launching apparatus, and that is has hitherto been generally accepted that the machine was wrecked without having had a fair opportunity of proving whether it was capable of flight. He then proceeded to show how the Hammondsport machine was altered to enable it to fly, and showed slides illustrating the machine getting off the top of the houseboat, which, he claimed, showed how the wings of the original machine twisted under load. 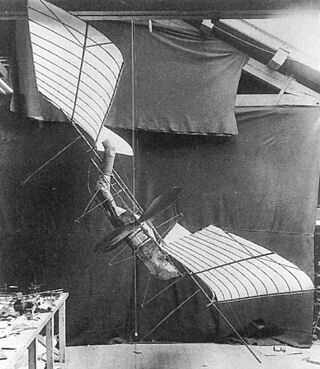 He also stated that this twisting was the probable cause of the failure of the machine to fly rather than any defect in the launching apparatus. Figs. 1 and 2 are side elevations of the original Langley machine of 1903 and the Hammondsport machine of 1914, prepared by Mr. Brewer. In Figs. 3 and 4 the wing trussing of the same machines is indicated. The differences will be clear to readers of this journal without further comment. Mr. Brewer's claims are, in the main, that the alterations were so extensive and of such a nature that the machine could not justly be called the same as the original Langley of 1903. The lecturer then described some of the early trials with the Langley, pointing out that during the time immediately following the tests there was no mention of any failure on the part of the launching gear. He called attention to the placing of the wing trusses and guy posts, G (Fig. 1), which were, he stated, 28 per cent, of the chord back from the leading edge. His contention is that, once the machine had left the launching apparatus, the centre of pressure would be behind the position of the king-posts, or at about 37 per cent, of the chord. As a result of this the wing would tend to twist, and by way of proof that this actually happened, Mr. Brewer showed slides of photographs taken immediately after the launch. We reproduce one of these photographs herewith, which certainly appears to substantiate Mr. Brewer's claim. The front wing is obviously twisted, its trailing edge bearing against the propeller framework. The effect of this distortion would naturally be to cause the machine to dive, and it is to this distortion that Mr. Brewer attributes the failure of the machine to fly, not to any fault in the launching apparatus. Several of the slides shown illustrated the bending back of the lower king-post G in such a manner as to indicate a very considerable twisting of the wing, such as might be caused by the c.p. being too far behind the wing trusses. As regards the changes made in the Hammondsport machine, Mr. Brewer enumerated these very thoroughly. We have not the space here to publish all of them, but they may be briefly summarised as follows: New wings were constructed in which the portion of the wing in front of the front spar was omitted. This reduced the camber from about 1 in 12 to about 1 in 18. It reduced the wing area and changed the aspect ratio. The top guy post was replaced by a much taller inverted V, and the lower guy post by four much heavier posts. 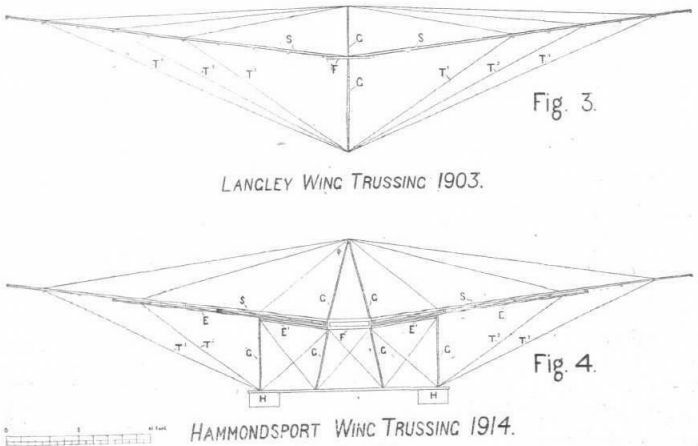 The guy wires at Hammondsport were attached to the spars at different points from those in the Langley machine. The whole system of trussing was moved 30 inches farther back, so as to be near the normal centre of pressure of the wings. The middle spar of each wing was strengthened by an additional spar underneath the ribs and extending outwards for about two-thirds of the length of the spar. The wings were further strengthened by the under truss work, GGGG and E1E1 (Fig. 4), diagonally braced, rigidly supporting the wings to about a quarter of their length out from the central frame. 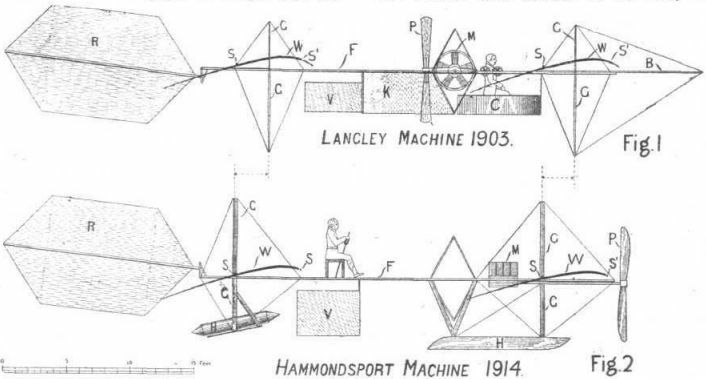 The ribs of the Hammondsport machine were heavier and stronger than those of the Langley. Floats, unknown in the day of Langley, were substituted for the original launching gear. The large fixed keel vertical surface (K in Fig. 1) was omitted, and the small split vane steering rudder was replaced by a single rudder (V, Fig. 2) of larger area. Further, the divided rudder of the Langley was intended to steer the machine, while the rudder in the Hammondsport machine was connected up to a hand wheel or to the Curtiss yoke, which was the standard Curtiss system of lateral control at the time. The rudder V of the Hammondsport machine was not, therefore, intended for steering but for lateral control. 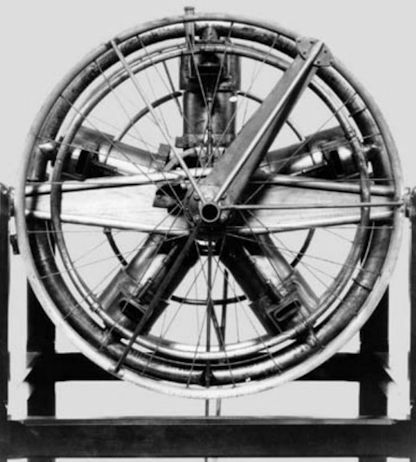 The tail of the Langley machine was adjustable up and down by a self-locking hand wheel, while in the Hammondsport it was coupled to a regular Curtiss steering post. The original carburettor was changed for one of modern type. The tail of the Langley was adjustable up and down only, and not about a vertical axis. In the Hammondsport machine it was connected to a regular Curtiss steering wheel. Mr. Brewer contends that: The Langley machine was not capable of sustained flight and that the inscription on the Langley machine in the Smithsonian Institution at Washington should be changed to accord with facts. Langley’s Aerodrome (7 October 1903). 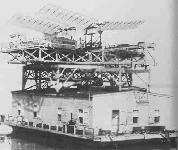 Two separate attempts were made to launch the original Aerodrome from a houseboat in 1903 - the first on October 7 and the second on December 8 (only nine days before the Wright brothers’ famous flights at Kitty Hawk) - both of which concluded with the machine suffering structural failure and fluttering into the Potomac River. Samuel Langley (furthest left) supervises preparations for the launch of the original Aerodrome from the roof of a houseboat in 1903. 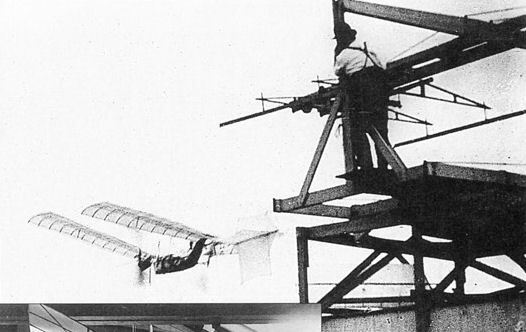 Despite both attempts ending in a dunking for the pilot, Charles Manly, Langley continued to insist that the aircraft was airworthy, but had failed owing to a defect in the launching apparatus. Fig. 5. - Langley machine viewed from below, front wings twisted and bent against framework. The Aerodrome breaks up and drops into the river (8 December 1903). Meddling with history - Curtiss engineers work on the first-stage reconstruction of the Langley Aerodrome at Hammondsport in 1914. 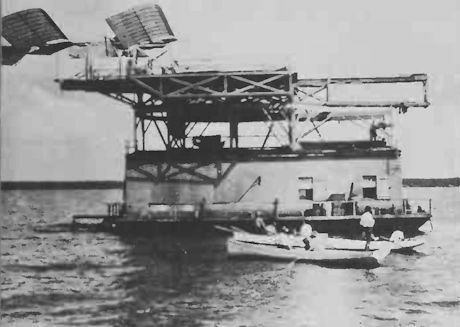 The original 1903 Aerodrome had no undercarriage, unlike the reconstruction, which sported pontoons as seen here, and was considerably flimsier than its 1914 iteration. Charles Doolittle Walcott (furthest left) contemplates the incomplete Aerodrome at Hammondsport in 1914. Other members of the group include Albert F. Zahm (furthest right), Glenn Curtiss (second from right) and Walcott’s daughter Helen. Note the automobile-type radiator which replaced the finned tubes on the 1903 original. 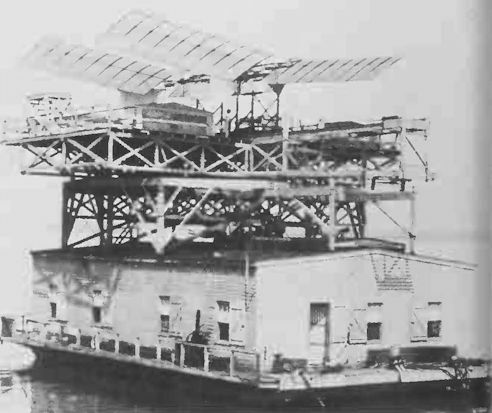 Showing the merest glimpse of air beneath its pontoons, the much-modified Aerodrome lifts from the surface of Lake Keuka on June 2, 1914, with Glenn Curtiss at the controls. The fixed tail surface was altered to become a movable rudder during the first set of modifications and a large underfuselage rudder was also fitted. The Aerodrome was modified yet again, even more radically, for more flights from Lake Keuka later in 1914. The pilot’s position was completely relocated atop the wings and further aft and, significantly, the original engine and twin pusher propellers were replaced with a modern 80 h.p. Curtiss engine driving a single tractor propeller. 28 мая 1914г. после доработки крыла и системы расчалок, а также установки самолета на поплавки, "Аэродром" Лэнгли управляемый Кертиссом смог выполнить первый полет. BASED ON A design by New York-based engine builder and former Tiffany’s watchmaker Stephen Balzer and co-developed with Langley’s assistant Charles Manly, the five-cylinder water-cooled radial engine that powered the original 1903 Aerodrome, the world’s first purpose-designed aircraft engine, was a remarkable piece of engineering for its day. Originally fitted with a Balzer carburettor consisting of a chamber filled with lumps of porous cellular wood saturated with gasoline, through which air was drawn, the engine was modified for the 1914 flights (as seen here) with an automobile-type carburettor with a float feed. The original radiator, made up of tubes with radiating fins, was also replaced, with a car-type “honeycomb” radiator. Аппараты Aerodrome Лэнгли. 1896: американский математик и физик Сэмюэль Пирпонт Лэнгли (родился в Массачусетсе в 1834 году, умер в 1906-м) осуществил первый подтвержденный полет беспилотного летательного аппарата тяжелее воздуха. Модели планеров Aerodrome 5 с размахом крыльев 4,25 м (на фото) и Aerodrome 6, запущенные со второго этажа плавучего дома на реке Потомак возле Куантико, набирали высоту до 1280 м. Каждая модель была оснащена паровым двигателем, установленным в средней части фюзеляжа и приводившим во вращение два воздушных винта. В 1898 году Лэнгли получил государственную субсидию $50000 на разработку полномасштабного летательного аппарата Aerodrome с размахом крыльев 14.6 м, который был закончен к 1903 году. Looking at first glance very similar to the 1903 Aerodrome, except for the floats, this artwork shows the aircraft in its May-June 1914 configuration, with revised bracing, narrower-chord wings, pontoons, reinforced spars and ribs and other changes including the propeller blades, reshaped in an effort to increase thrust. In this composite artwork, the parts of the Aerodrome that were removed in 1914 are shown in red and those that were added or modified are shown in blue. Apart from the addition of the pontoon floats replacing the original small flotation-aid tanks, note especially the deletion of the 19ft2 (1.76m2) central fabric “keel” surface. LEFT Looking down into the cockpit “boat” from a viewpoint just above the 1903 Aerodrome, this image shows the twin-“trimwheel” controls, and the original ignition system. 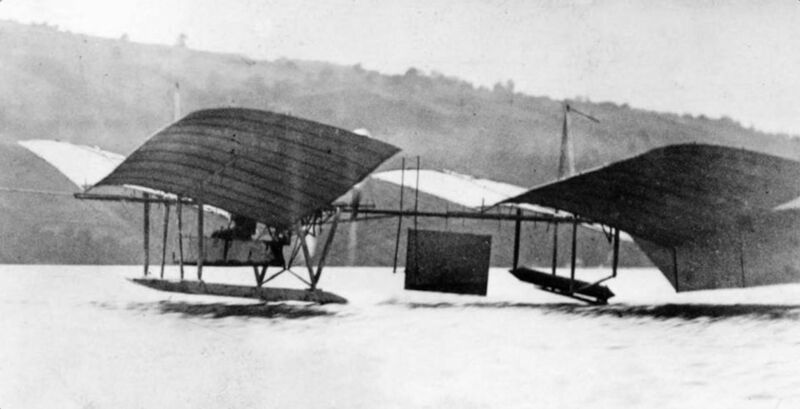 RIGHT This front three-quarter view of the 1903 version shows the frail kingpost bracing system and the original helical propeller-blade shape. LEFT Rotating the 3D artwork of the 1914 version to a more frontal view reveals the sturdy A-frame wing struts and associated float struttery. RIGHT The 1914 cockpit. Note the conventional wheel for pitch and yaw control; the pilot would use a Curtiss shoulder-yoke for roll control, hence the seat-rail for him to bear against. LEFT The truncation of the wing leading edges (seen in red) increased the aspect ratio and reduced the camber. RIGHT Zooming in on the Manly-Balzer engine installation shows how the finned-tube radiators were replaced by a more conventional unit. Download all these 3D artworks from our website to explore them fully. 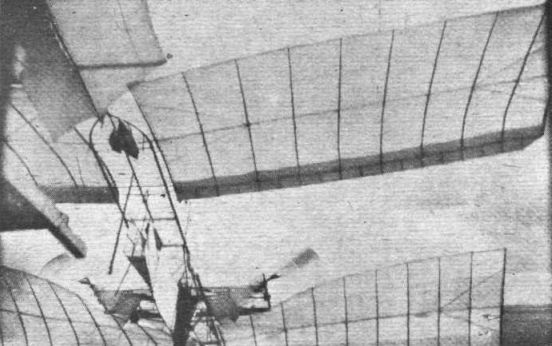 Langley's tandem-winged machine of 1903.